Here's something while you are waiting for OpenOffice.org 2.4.0 final. 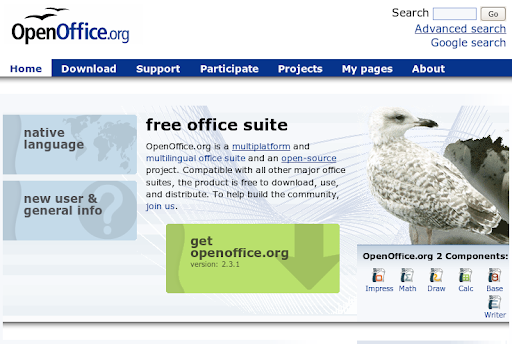 Maarten Brouwers announced that today around 20:00 CET (19:00 GMT, 2:00pm EST) we should see a new OpenOffice.org home like below. You can preview it at http://test.openoffice.org/. Here's the current (old) page. Finally, when 2.0.0 was finally released, the eggs hatched and the seagull emerged, which is what you see now. Very nice design! Much better than the old one.. It's definitely cooler than the old one and it's clean, which is awesome. My only criticism is that the header looks a bit faded and that the toolbox isn't easy to see, initially (yes, I admit that it is mainly for the already initiated).